Skyscraper News reports that the Citygate Ecotower is designed to be the most environmentally friendly skyscraper on earth. The building features photo-voltaic (solar) panels that are incorporated as a part of the cladding system, which channels the captured energy directly onto on-floor outlets to run equipment like computers and laptops. I didn't like the tower's design at first. But the more I learned, the more I liked the concept. The architects have really planned out the tower's intended use and I have come to realize the uniqueness and beauty in its design. 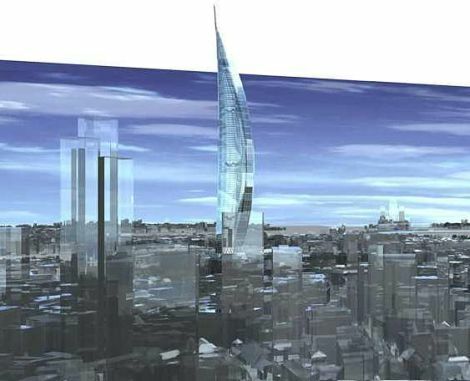 Excess energy generated by the tower would be sold back to the grid to offset other energy costs. The solar panels, ventilated facades and wind turbines are anticipated to reduce the building's net energy costs by up to 60%. 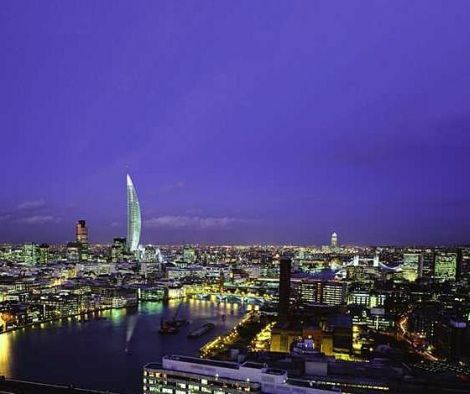 The building will be mixed use with retail space towards the bottom of the tower, larger floor plans for office and hotel space in the middle, and residential/penthouse space, with amazing views of London, between floors 88-102 towards the top. Sky parks have also been designed that will be open and accessible to the public. 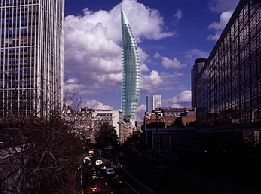 The tower's design would harvest the wind into turbines at the open section of the tower between levels 12-18. This helps to reduce turbulence at the base of the tower. The tower will be built with London's public transportation network in mind. Those traveling by subway will be able to access the tower directly by lift, reducing the building's street level impact. 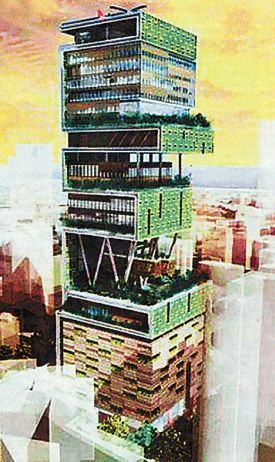 India's Richest Man To Build 60-Story Home...Al Gore Up In Arms! Just kidding...about Al Gore but not about the 60-story home. His name is Mukesh Ambani and he is the richest man in India. He is planning on building a 60-story home for his family in the heart of Mumbai. The monstrosity will feature a helipad, health club, hanging gardens, six floors of parking and 600 live-in staff. I guess it was only a matter of time before the Ambani family outgrew their current home...a 14-story building named Sea Wind. Mr. Ambani was ranked 14th on the 2007 Forbes' richest worldwide rankings list with a net worth of around US$20.1 billion. Since the ceilings are 3x as high as a normal buildings, the tower will only have 27 floors. I am interested in seeing pictures on this one...I don't even know why someone would build such a thing. This blows extravagance so far out of the water its not even an issue. Convert to Plug-In or Buy Brand New? Looking For A Parking Spot? Enter Streetline! Are Gas Prices Causing A Suburbian Exodus?